Do You Chat While Playing Bingo? Do you have memories of playing bingo as a child? Do you remember being gathered together with friends to receive some cards? What fun that was, playing with your friends and hoping that you’d get Bingo before them. That’s one of the many reasons people play bingo today. Now imagine playing bingo all by yourself with a computer running the calling. It doesn’t sound much fun, does it? And yet, bingo sites like ours have been flourishing for years and years. Why? Because we put the social element back into the game through our chat room function. In fact, we wouldn’t be surprised if our chat rooms are an even bigger draw than the bingo! Our players get to know each other through the chat rooms while the game plays. We’ve had people strike up life-long friendships with people all over the world, and even a few romances as well! The demographics of our players show a wide range of ages and locations. A lot of women like to chat in our rooms. It’s a great place to meet people in a safe location. A previous story we shared tells about the power that online chatting and bingo can provide. Two women in the UK had struck up a friendship on a bingo chat room, talking for years and years. It was eventually discovered they were long-lost sisters! They’ve since met and are trying hard to reunite the rest of their separated sibling family. People tend to be very polite in the chat rooms by offering praise to the person who won and sympathy to those who lost. People come here for fun, not to put other people down. This is a sentiment not found in many gaming channels anymore, much to our chagrin. If you have any questions about Mania’s bingo games or about the chat rooms, the first place to start is to talk to the chat room moderator. The moderator is responsible for the smooth function of the game and of the chat room. They can educate you in how the game is played and the functions of the game board and of the chat room. They facilitate conversation and throw out people who break the rules. Many of our moderators started as regular players and gained moderator privileges due to how well they helped the chat rooms function. Don’t be afraid to ask questions! Bingo chat room boards may have started as an extra-value feature, but they’re now a core component of all online bingo sites. The ability to converse with other players while the game is in progress is a huge advantage over dead-silent bingo halls. 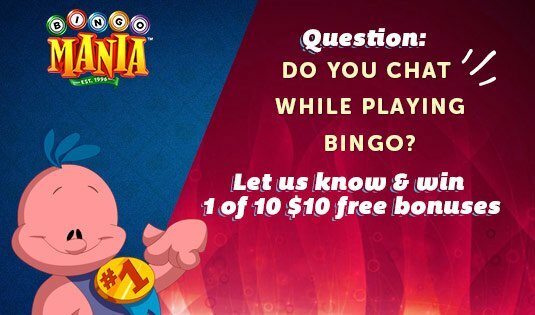 So if you want to make a bunch of new friends while bonding over a fun game that could net you a little bit of spending cash, sign up for a BingoMania account and get in on the action today! You’ll be glad you did and our players are ready to meet you. Who knows? You might even spark up a romance with someone.